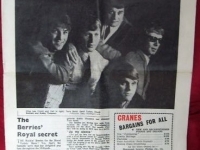 Full copy of Midland Beat No 4, January 1964 featuring The Shadows, Ringo Starr, all girl group The Orchids, adverts for the TWO Brum Cavern/Kavern clubs and a racist cartoon! I ran two music columns for Dennis’ Midland Beat and gave him front pages such as the Rolling Stones photo reading MB. Does an archive exist of old issues? There are a number of issues I understand in the Library archive. I may be wrong on that but I’m sure someone told me they were there. The archives at Birmingham Library have approx 90% of the published issues of Brumbeat on file..you can view them but you have to book..slight problem is that that the archive is closed until September 2013 when the new library opens. There seems to be a little confusion between Midland Beat – something I never saw – probably because I was too young and Brum Beat (Late 70s – 80s) that I seem to have around 80% of at home. Which one do the library have? If I ever get a scanner working again, are there any particular things this archive needs from it? Hi William, yo are right, the Library of Birmingham definitely has Brum Beat (or had, let’s hope they have kept them following their move). I think they also have some Midland Beat as well. I’d love to scan complete issues of Brum Beat, a pain staking job but it would be a great resource for the archive! Trouble with scanning Brum Beat is that most scanners are A4 and BB was more than twice that size for most of its run. I’ve been checking through the old issues for material relevant to another history project to scan so if there’s anything particular you’re looking for, I can maybe get some things scanned and sent over. Looking at the set again, 80% was probably optimistic. For what it’s worth, I could probably scan whole issues except for the problems of page size – apart from that it wouldn’t be the first time. William, are you talking about Midland Beat or Brum Beat? Brum Beat I thought was A4 size (i’ve got a few of them with me here). For the first few years Brum Beat was newspaer size. Since I don’t have the copies to hand, I can’t give exact numbers but the first issue is from 1980 (I assume – mine start at no. 2) and they were still using the newspaper format after issue 100. They then moved to half that size and finally added glossy covers. I think they were going to start charging when I stopped getting copies. I have 11 copies of midland beat from 1964 – 1965. Have just started to have them copied to A3 format and will laminate the copies. The early editions were A4 size but later changed to A3 size. Some magazines are for sale on Ebay and Im interested inbuying two of them as I was a Drummer in a group called The Telstars and Ian Sludge Lees was our singer – we feature in many of the magazines – that ‘s my interest. I Will gladly send anyone copies if needed .TheTelstars worked on the regan circuit for two years – Plaza Handsworth – Plaza Old Hill – Ritz and Brum Kavern plusmany local venues. Would love to hear from anyone who remembers us or were involved in the same . I eded up as a Professional Dance teacher with my wife Rita – look us up on the net. Great times great memories. Your welcome to show my Email or phone number. I’d love to get scans onto the site, I’ve got lots of Brum Beats that I need to scan in so to have them next to Midland Beat would be fantastic. I must have around 30 copies of Midland Beat from 1964 to 1967 somewhere in my loft so I’ll see if I’ve got April/May 1966. If so, I’ll scan items about “Listen” if you let me have your email address. Just read your entry in the Birmingham Musical Archive that you have 30 copies of Midland Beat 1964 to 1967. I am looking for an article on a group called Veeble Peeple a Leicester band. I believe its in issue No 24 September 1965. Would be very interested to know if you have that copy. Brian has just dropped off the Midland Beats for me to scan. I’ll look for you when I get into the office. I’d love copies of the Midland Beats, Colin, love them to bits. 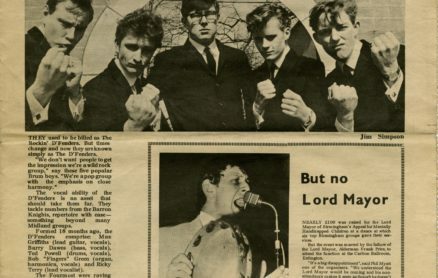 I was in a band called the Cast, Ladywood based and we played the Midland Beat Contest (1966?) held at the Locarno in Birmingham. Got about 20th as the result had already been ‘decided’ a fact I found out on joining another band in the early 70s, the leader (bass player) saying ‘Oh, I remember it well, me and ****** ***** sorted that one’. Probably bull**** as he was full of it, great fun tho. When we were playing my girlfriend and her pal were watching and just as well too as my blue sparkle top tom tom fell off the bass drum and bounced down every layer of the stage into the audience. Great fun and times. The Locarno was PACKED that night. Thankfully the organist’s sister took pictures from the balcony overlooking the stage, one I have, faded now but in colour. The Bobcats were also on the bill. 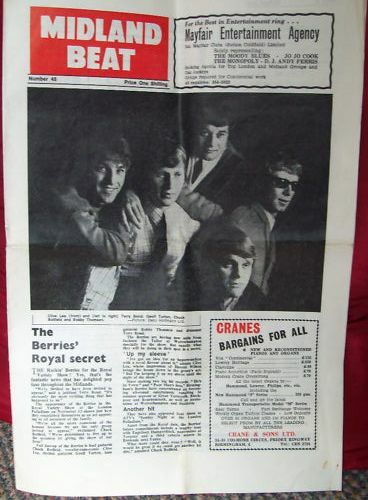 Hi, I’ve just come across an old copy of MIdland Beat, No.20 from May 1965 which has been in my attic for 50 years. I don’t know how I got it as I live in Halifax Yorkshire and played round the Yorkshire clubs etc in the 60s, never went south of Sheffield. Quaint to see all those eager young faces and full heads of hair from 50 years ago, all old men like me now in a different world! If you would like the paper for your archive I will gladly send it to you, if you don’t already have it. Or I could photograph the pages and email them. Just let me know. I am still a keen guitar player at 71, mostly theatrical shows and choir concerts etc. Have you got to the office and had time to look for that Midland Beat issue 24 from 1965 with the article about Veeble Peeple yet? Apologies if you haven’t had time.